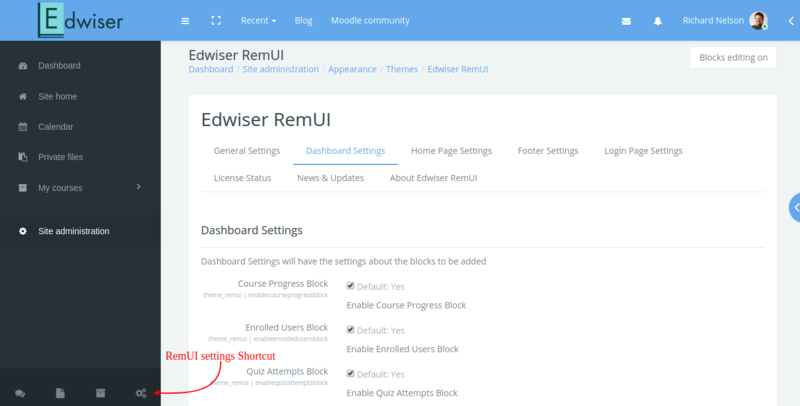 The Edwiser RemUI – user experience theme for Moodle – ameliorates the basic Moodle LMS interface. Dashboard Settings: Allows you to set which RemUI specific blocks should be displayed in the Dashboard. Home Page Settings: The homepage contains sections to display custom content about your business. You can fine-tune the content using the Home Page Settings options. This tab also contains settings for the slider on the front page. You can set the images, text and button links here. The Edwiser RemUI documentation has you covered here. Once you activate the Edwiser RemUI theme, you should be able to notice a stark difference between Edwiser RemUI elements and Moodle’s default interface. Edwiser RemUI takes care of highlighting sections of the layout and making actionable items clearly visible; thus enhancing your content creation experience. The ‘quick links’ in the top menu and the left sidebar make it easy for you – the LMS admin- to easily access content, settings and create courses, events and activities. The top navigation menu contains several easy access options. Quick Links are the highlight of Edwiser RemUI. The Right and Left Sidebar is an LMS administrator’s arsenal. 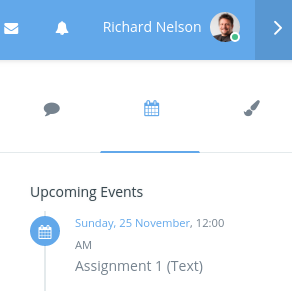 The Right Sidebar has Contacts, Calendar and Color customization options. 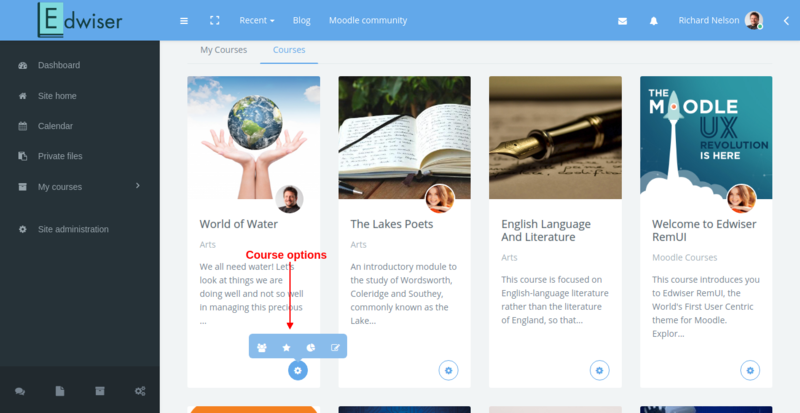 The course archive page, or the all courses page on Moodle has been completely revamped in Edwiser RemUI. Course Stats: User/Student’s activity progress in the course. Tasks to complete: To view assignment, quiz, lesson, course deadlines. Course Progress: Student’s progress in the course which is Teacher centric block. Enrolled Users: Graphical representation for the number of students enrolled in courses per category. Quiz Attempts: Graphical representation for the number of students attempted the gradable activities vs the total number of student who haven’t attempted the activities. Course Analytics: Graphical representation of the user’s last attempt in the gradable activities of a particular course to the global average in that course. Recent Feedback: This block displays a recent submission done in the course so that it is notified to the teacher. Recent Forums: This block displays recent activity related to the user in the forums. For a first-hand experience of the theme, we highly recommend taking a look at the demo! And any pre-sale questions or doubts you might have could be directed to us using the support form on our site!